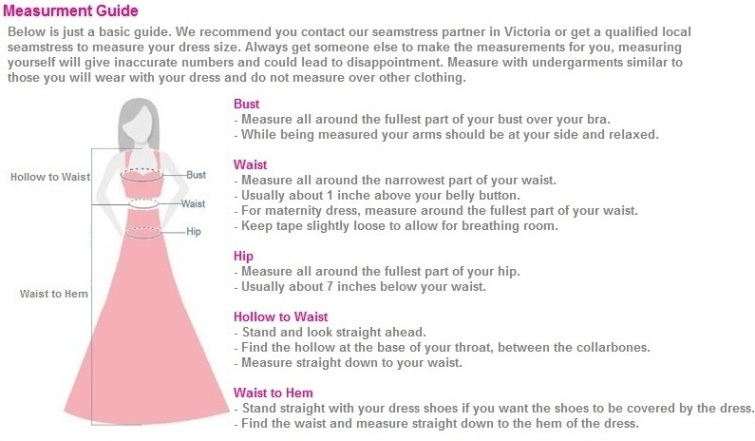 Size: All of our dresses are custom made to your measurements, please follow the measurement guide below and send through your measurments when order. Alternatively you can order in a standard size. Please feel free to email us your requirements or ask for measurment assistant. Wedding gowns are fitted garments, so wedding dress alternation is common and might be needed. All our gowns are capable for your alteration need. If you locate in Victoria, we are happy to recommend you to Lilian Fashion Alterations in Chadstone, the local alterations specialist for alterations whom is our reliable business partner. Fittings and alterations cost: From $200 for a complete fittings and alterations service. Perfect Tailor Made Solution. Tailoring Time: 4-6 weeks. If you require your dress urgently, please contact us to confirm as we have a fast track service for most of the designs at $30 surcharge. Shipping Time within Australia: 1-5 business days depending on your location. Shipping Time outside Australia: 4 - 6 business days for most countries depending on your region.